Ed!’s sole mission is to raise funds to support our public schools. Ed! is unique in that it is the only parent and community organization that can pay for credentialed teachers, counselors and academic programs. Funding from Ed! to ESUSD is given in the form of a grant, which is planned and annualized. In the spring, a committee made up of Ed! board members, parents, board of education representatives and ESUSD representatives is formed. The committee works on determining the monetary needs needs from the school district for programs and projects ESUSD needs for successful students and a growing school district. A grant is then written up and presented to the Ed! Board for approval. Approval will be based on monetary needs of ESUSD as well as current and past abilities of Ed! to fundraise. The El Segundo Unified School District, with vital support from the Educational Foundation, continues to be a leader in transforming education and inspiring student success. Through its generous annual contribution to innovative programs, the Educational Foundation impacts the future of every ESUSD student. All funding supports 21st Century Learning Skills and California Common Core State Standards, thus preparing our students for success in higher education and the workplace. Students need specific knowledge in core subjects as well as an understanding of such 21st Century themes as global awareness; financial, economic, business, and entrepreneurial literacy; civic literacy; health literacy; and environmental literacy. Education must go beyond the three R’s of yesterday to encompass a range of skills that will help students function as productive citizens who are health conscious, appreciative of the arts, and award of the importance of good manners and skills. International Baccalaureate, The Middle Years Programme ($20,000), a globally recognized educational framework designed develop students as inquirers, risk-takers, and communicators who are empowered to create change, continues with high honors at El Segundo Middle School. With the program in place, ESMS has earned the Gold Ribbon School Award, the Golden Bell Award, and the Civic Learning Award of Merit. ESMS has become a model program visited by prospective schools around the state and world. Funding will be used for Official IB Training for administrators and teachers, development of real world units of study and assessments and other IB costs. Junior Achievement – Financial Literacy ($8,000) inspires and prepares students to succeed in a global economy through experiential, hands-on programs. Junior Achievement educates students about entrepreneurship, work readiness and financial literacy. The program helps prepare young people for the real world by showing them how to generate wealth and effectively manage it, how to create job to make their communities more robust, and how to apply entrepreneurial thinking to the workplace. Students put these lessons into action and learn the value of contributing to their communities. As a result, students are equipped to effectively manage their futures and contribute to society. Robotics ($38,000) continues to grow in popularity with students in grades 6 – 12 at both the middle school and high school level. This ongoing program allows students to “think outside the box,” as well as network with like-minded students. Students find themselves depending on one another for problem solving, collaboration, communication, and developing a tireless work ethic to support the rigors of the program. Students engage in enterprise dedicated to building a functioning robot to enter into competitions, as well as showing up prepared to brainstorm “on the spot” to solve complex problems handed to the team by the judges with as little as one hour to solve the problem. One important aspect of the Robotics program is the level of support and mentorships by Northrop Grumman, Boeing, Los Angeles Air Force Base and other aerospace companies, with professional engineers and scientists laboring shoulder to shoulder with dedicated students late into the night to ready them for competitions. The Robotics Program has competed and placed strongly in several major competitions. They were the statewide winner in the Chevron Design Challenge for California and won the Mentor’s Award at the Real World Design Challenge National Championship in Washington, D.C.
Computer Science ($85,000) funding will allow both Richmond Street and Center Street to provide a uniform curriculum, which includes coding, for all K – 5 elementary students with integration of the International Technology Standards. Instructional assistants at each school will collaborate with teachers to implement lessons that are integrated into all subject areas and aligned with California Common Core State Standards as well as Next Generation Science Standards. It is particularly important that every student be adept in utilizing technology in order to be successful on the new standardized state testing, which is taken on a computer or tablet. Biomedical Sciences Pathway (Project Lead the Way) ($100,000) moves into Year 4. The rigorous and relevant four-course sequence allows students to investigate the roles of biomedical professionals as they study the concepts of human medicine, physiology, genetics, microbiology, and public health. Each course in the Biomedical Science sequence builds on the skills and knowledge that students gain in the preceding courses. In the final course, students design innovative solutions for pressing health challenges of the 21st century. The curriculum is specifically designed to create hands-on experiences to give students real world exposure to scores of different careers supporting medicine – one of the fields trended to undergo the largest explosion of career opportunities in the next several decades. Jobs in the medical field are predicted to grow 27% as opposed to other sector job growth of 17% by 2020. Students will be exposed to guest speakers, integrated lesson plans requiring not just critical thinking but also collaboration and communication, while using creativity to solve medical problems embedded into the exciting curriculum. Math Coaches K-5 (Cotsen) ($90,000) strategically provides intensive mentoring over two years. We offer fellowships to a handful of teachers within a school, giving them a full-time mentor and useful resources for studying and perfecting their craft. The ART of TEACHING mentoring program is unique. It is designed for the teachers who are often ignored by the school system because they are so effective and do not require intervention. It is designed to enable those with the most potential to become the very best in their profession. The ART of TEACHING promotes excellence because excellence in teaching is what every child needs. Teacher fellows and mentors have access to professional development through Cotsen throughout their lifetime. Middle School Foreign Language ($240,000) knowing that learning a foreign language is critical to communication skills, international mindedness, intercultural understanding, and competitiveness in the job market, ESUSD aims to educate all students in Spanish beginning as early as 6th grade. Students use the evidence-based IB model to teach Spanish as a foreign language which enables students to advance to high levels of Spanish in high school. New for 2017-18, Spanish will be full-year courses at ESMS, rather than half-year (A/B) courses. ESUSD K – 12 Music/Vocal Program ($208,000) is a direct reflection of creativity, self-expression, appreciation for beauty and honing of talent. Students at the elementary level eagerly look forward to the music hour incorporated into the weekly curriculum. All students at all levels enthusiastically support the performing arts aspects of the programs where they learn to collaborate and communicate while performing and presenting themselves to the public in a composed and professional manner. The music program is one that lends itself to the greatest amount of articulation and collaboration among school sites and grade levels. The elementary choirs include 140 students who perform with the district-wide Songfest as well as entertain at community events. At the high school and middle school levels students participate in regional and national competitions and events. The Eagles’ Nest Preschool Music Program is an opportunity for three and four-year-old students to participate in the “Music ‘n Motion” program, setting a foundation for future grade levels. The Middle School Strings Program ($16,000) is an extraordinary program for those students who have a passion for orchestra. ESMS offers three levels of Strings: Beginning, Orchestra, and Chamber which allows students a progression for growth and excellence. Orchestra and Instruments Program ($22,000) has expanded to the high school and continues to grow. The Strings and Orchestra courses provide an unparalleled opportunity for the very serious musician to advance his/her skills. Band Director (80,000) will continue the statewide success and continue to strengthen and grow our music pathway for instrumental music. A credentialed music teacher will continue working with the middle school and high school to lead and instruct a competitive marching band. Musical Instruments ($10,000) will give students continued access to the instrument of their choice to create ample opportunities for all budding musicians to participate in the arts. Musical Production/Technology ($32,000) in its fourth year continues to appeal to our “electronica” musical enthusiasts at the middle school level. Students have the opportunity to create, produce, perform and compile complex layered musical creations in a more modern technologically driven module as an outlet of self-expression. They collaborate to develop unique communication and music. Elementary Art Instruction ($41,000) this year we have taken the beautiful art program lead by parent docents and have grown the program by partnering with an outside company to help ensure students in all grades can create and reflect upon what they’ve produced, construct meaning through art, and understand historical and cultural influences, as well as the significance of art in their lives. All elementary students will have access to uniform art experiences and instruction through our partnership with a standards aligned art program. Arena Art Instruction ($8,000) at the continuation high school provides new opportunities and outlets for at-risk students. A 2005 report by the Rand Corporation about the visual arts argues that the intrinsic pleasures and stimulation of the art experience do more than sweeten an individual’s life — according to the report, they “can connect people more deeply to the world and open them to new ways of seeing,” creating the foundation to forge social bonds and community cohesion. What better way to bring our most vulnerable students back into the fold. High School and Middle School Drama ($18,000) exposes students to a world of communication strategies including public speaking, text analysis, dramatic interpretation and analysis of subliminal messages buried in context. Creativity, collaboration, and critical thinking skills are all integrated into the fabric of the drama program, allowing students to develop their own voice, world-view and a safe place for self-expression. In addition, the local community is able to witness another exceptional ESUSD program through a stellar lineup of performances. Literacy Programs ($10,000) at both elementary schools provide a safety net for struggling readers and English language learners through the expertise of literacy teachers and instructional assistants. The literacy teachers also play a vital role in professional development for all elementary teachers and instructional assistants. The District will provide primary funding for this program as it meets targeted intervention purpose for the Local Control Funding Formula. ESHS Counselor, 10th Grade Stipends ($10,000) allows the parents of every single 10th grade student to have a personal planning session with their child’s counselor to help map out the a career/college plan for the path to graduation. ESMS Counselors ($120,000) assist students in navigating difficult waters during a critical point in their education. Middle school can be a pivotal point in adolescence. The counselor not only serves as an academic advisor but also helps students in the process of young adulthood where the social and emotional stresses can be overwhelming. Programs are designed to help students inside and outside of the classroom. ESHS Counselor ($80,000) High school counselors serve as a communication life-line for students and the outside world at the most important juncture of their lives – preparing for college or career futures. Helping students learn how to prepare college applications, present their best selves on paper and in person, help students through the trauma of college acceptance letter, vocational career choices, over-crowded junior college courses, is an indispensable part of a young person’s link to their futures. Librarians ($130,000) are provided in partnership with the City of El Segundo. The school library is central to learning and the school librarian is essential to the daily operation of the school library. School librarians make a difference to students’ understanding and achievement and provide support for teaching and learning throughout the school. The school librarian is an important part of the school community and reflects and welcomes this community. Our librarians facilitate engagement with all kinds of reading, cultural activities, access to information, knowledge building, deep thinking and lively discussion. Through Ed! the library services have been restored to allow students access to the library five days per week at all comprehensive campuses. AVID (Advancement Via Individual Determination ($10,000) is a school-wide ESHS program for grades 9 – 12 designed to maximize students’ academic potential through skill building for success. The support the ESEF provides, allows approximately 120 students from diverse backgrounds to learn personal responsibility, take ownership of their work ethic, and develop and implement written and communication skills across the curriculum. AVID also exposes these underserved students to the reality of a college education enriching their lives – often the very first generation to enjoy such luxury. Yearly excursions to college campuses create a visceral connection to a reality long elusive to them. The District will provide primary funding for this program as it meets targeted intervention purpose for the Local Control Funding Formula. Link Crew & Where Everyone Belongs ($10,000) is a highly defined and structured transitional leadership program that engages the incoming 6th and 9th graders in exciting and purposeful activities, introducing students not just to their new campus, but also introducing them to and pairing them with well-trained upper classmate mentors. This in turn models behaviors and social and academic skills integral to learning how to self-regulate and self-manage in difficult times, and helps embed structured discipline for academic achievement. Research indicates that students who transition from schools in a structured and supportive environment enjoy a higher level of success, both emotionally and academically. Where Everyone Belongs (WEB) is modeled after Link crew for incoming 6th graders to help in their transition and sense of belonging. Elementary PE Teachers for grades 1 – 5 ($114,000) allow students to learn to work in collaborative and supportive groups, negotiate leadership positions, communicate verbally and via body language. Instruction encourages fairness and positive citizenship, imbues compassion and competitiveness. Students learn life-long, healthful habits and skills that will serve them throughout their lives. 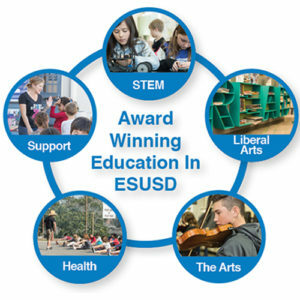 International Baccalaureate, The Middle Years Programme ($20,000), a globally recognized curriculum designed to broaden students’ mindsets by developing inquiring, knowledgeable and caring young people, who are motivated to succeed, continues with high honors at El Segundo Middle School, having received the Gold Ribbon School Award. Ms. Stern was a speaker at the IB Conference of the Americas in Washington, D.C. Funding will be used for Official IB Training for administrators and teachers, development of real world units of study and assessments and other IB costs. Junior Achievement – Financial Literacy ($8,000) inspires and prepares students to succeed in a global economy through experiential, hands-on programs. Junior Achievement educates students about entrepreneurship, work readiness and financial literacy. The program helps prepare young people for the real world by showing them how to generate wealth and effectively manage it, how to create jobs, which make their communities more robust, and how to apply entrepreneurial thinking to the workplace. Students put these lessons into action and learn the value of contributing to their communities. The result being, students are empowered to believe in themselves and the difference they can make in the world. Robotics ($35,000) continues to grow in popularity with students in grades 6 – 12 at both the middle school and high school level. This ongoing program allows students to “think outside the box,” as well as network with like-minded students. Students find themselves depending on one another for problem solving, collaboration, communication, and developing a tireless work ethic to support the rigors of the program. Students engage in rigorous enterprise dedicated to building a functioning robot to enter into competitions, as well as showing up prepared to brainstorm “on the spot” to solve complex problems handed to the team by the judges with as little as one hour to solve the problem. One important aspect of the Robotics program is the level of support and mentorships by Northrop Grumman, Boeing, Los Angeles Air Force Base and other aerospace companies, with professional engineers and scientists laboring shoulder to shoulder with dedicated students late into the night to ready them for competitions. The Robotics Program has competed and placed strongly in several major competitions. They were the statewide winner in the Chevron Design Challenge for California and won the Mentor’s Award at the Real World Design Challenge National Championship in Washington, D.C.
Computer Science ($85,000) funding will allow both Richmond Street and Center Street to provide a uniform curriculum for all K – 5 elementary students for the first time. Instructional assistants at each school will collaborate with teachers to implement lessons that are integrated into all subject areas and aligned with Common Core State Standards as well as Next Generation Science Standards. It is particularly important that every student be secure with computer technology skills in order to be successful on the new standardized state testing, which is taken on a computer or tablet. Elementary Foreign Language Instruction ($80,000) will begin conversational Spanish in the 4th and 5th grades to begin student’s vocabulary development. The content will work in concert with the middle and high school Spanish instruction to have a stronger academic impact. The Middle School Strings Program ($16,000) is an extraordinary program for those students who have a passion for orchestra. Orchestra and Instruments Program ($22,000) has expanded to the high school for the first time. The Strings and Orchestra courses provide an unparalleled opportunity for the very serious musician to advance his/her skills. Musical Production/Technology ($32,000) in its third year continues to appeal to our “electronica” musical enthusiasts at the middle school level. Students have the opportunity to create, produce, perform and compile complex layered musical creations in a more modern technologically driven module as an outlet of self-expression. AP Art History (15,000) is being added to our visual and performing arts pathway (VAPA). This course will allow students to have access to an AP art class that will makes inter curricular connections and goes more in depth in art history. Elementary Art Instruction ($80,000) this year we have taken the beautiful art program lead by parent docents and have grown the program by hiring a credentialed teacher to ensure students in all grades can create and reflect upon what they’ve produced, construct meaning through art, and understand historical and cultural influences, as well as the significance of art in their lives. All elementary students will have access to uniform art experiences district-wide through a credentialed teacher. High School Drama ($18,000) exposes students to a world of communication strategies including public speaking, text analysis, dramatic interpretation and analysis of subliminal messages buried in context. Creativity, collaboration, and critical thinking skills are all integrated into the fabric of the drama program, allowing students to develop their own voice, world-view and a safe place for self-expression. In addition, the local community is able to witness another exceptional ESUSD program through a stellar lineup of performances. Librarians ($119,000) are provided in partnership with the City of El Segundo. The school library is central to learning and the school librarian is essential to the daily operation of the school library. School librarians make a difference to students’ understanding and achievement and provide support for teaching and learning throughout the school. The school librarian is an important part of the school community and reflects and welcomes this community. Our librarians facilitate engagement with all kinds of reading, cultural activities, access to information, knowledge building, deep thinking and lively discussion. Through Ed! the library services will be restored to allow students access to the library five days per week at all comprehensive campuses. Link Crew & Where Everyone Belongs ($20,000) is a highly defined and structured transitional leadership program that engages the incoming 9th graders in exciting and purposeful activities, introducing students not just to their new campus, but also introducing them to and pairing them with well-trained upper classmate mentors. This in turn models behaviors and social and academic skills integral to learning how to self-regulate and self-manage in difficult times, and helps embed structured discipline for academic achievement. Research indicates that students who transition from 8th to 9th grade in a structured and supportive environment enjoy a higher level of success, both emotionally and academically. This year we have added the program, Where Everyone Belongs (WEB) to the middle school for the first time. WEB is modeled after Link crew for incoming 6th graders to help in their transition and sense of belonging. Elementary PE Teachers for grades 1 – 5 ($114,000) allow students to learn to work in groups, negotiate leadership positions, communicate verbally and via body language. Instruction encourages fairness and positive citizenship, imbues compassion and competitiveness. Students learn life-long, healthful habits and skills that will serve them throughout their lives. Cognitive Guided Instruction Math Program (CGI) through UCLA ($50,000) continues professional development for Richmond Street and Center Street Elementary K – 5 staff, with the goal of fostering student development as problem solvers, mathematical thinkers, as well as students capable of articulating and building upon their own mathematical reasoning. The CGI program is aligned to the Common Core State Standards (CCSS) and is explicitly designed for grades K – 5. ESUSD K – 12 Music/Vocal Program ($190,000) is a direct reflection of creativity, self-expression, appreciation for beauty and honing of talent. Students at the elementary level eagerly look forward to the music hour incorporated into the weekly curriculum. All students at all levels enthusiastically support the performing arts aspects of the programs where they learn to collaborate and communicate while performing and presenting themselves to the public in a composed and professional manner. The music program is one that lends itself to the greatest amount of articulation and collaboration among school sites and grade levels. The elementary choirs include 140 students who perform with the district-wide Songfest as well as entertain at community events. At the high school and middle school levels students participate in regional and national competitions and events. The Eagles’ Nest Preschool Music Program is an opportunity for three and four-year-old students to participate in the “Music ‘n Motion” program, setting a foundation for future grade levels. Elementary Art Instruction ($30,000) has taken on a new level of instruction, as parent docents collaborate with teachers to provide students with weekly art lessons that encourage students in all grades to create and reflect upon what they’ve produced, construct meaning through art, and understand historical and cultural influences, as well as the significance of art in their lives. All elementary students will have access to uniform art experiences district-wide. ESMS Counselor ($80,000) assists students in navigating difficult waters during a critical point in their education. Middle school can be a pivotal point in adolescence. The counselor not only serves as an academic advisor but also helps students in the process of young adulthood where the social and emotional stresses can be overwhelming. Programs are designed to help students inside and outside of the classroom. Librarians ($142,000) are provided in partnership with the City of El Segundo. The school library is central to learning and the school librarian is essential to the daily operation of the school library. School librarians make a difference to students’ understanding and achievement and provide support for teaching and learning throughout the school. The school librarian is an important part of the school community and reflects and welcomes this community. ESHS Library/Tech Lounge Redesign ($25,000) will support our high school students to further expand 21st Century learning skills. Students will have a comfortable space to extend learning, work in small groups, pairs, or as an individual. Technology use will be supported through charging stations and an atmosphere of a flexible learning space. Link Crew ($5,000) is a highly defined and structured transitional leadership program that engages the incoming 9th graders in exciting and purposeful activities, introducing students not just to their new campus, but also introducing them to and pairing them with well-trained upper classmate mentors. This in turn models behaviors and social and academic skills integral to learning how to self-regulate and self-manage in difficult times, and helps embed structured discipline for academic achievement. Research indicates that students who transition from 8th to 9th grade in a structured and supportive environment enjoy a higher level of success, both emotionally and academically. Elementary PE Teachers for grades 1 – 5 ($114,000) allow students to learn to work in groups, negotiate leadership positions, communicate verbally and via body language, encourages fairness and positive citizenship, imbues compassion and competitiveness. Students learn life-long, healthful habits and skills that will serve them throughout their lives. In years past, the El Segundo Education Foundation has supported our district-wide vision of embedding 21st Century Skills into the curriculum. Additionally, the Foundation supported ESUSD’s assertion that the contribution the arts make to foster creativity, discipline, collaboration and a sense of well-being are non-negotiable. In previous years the Foundation’s support of programs was extraordinarily valuable. Unfortunately nothing has changed in the State budget for the 2012-13 year, which makes the continuing support of the Foundation incalculable. Without you, our students would be hearing the sound of doors slamming on opportunities for their very futures. Margaret Thatcher once famously stated: “If you stand for nothing, you’ll fall for anything” – thus highlighting the importance of teaching children how to think for themselves. Learning to sift through that interminable stream of information to analyze, sort, parse, compare, transfer and implement is of utmost importance. Understanding the importance of global markets and cultures is becoming an exponentially important skill – 59% of jobs created worldwide in 2011 were at the hands of entrepreneurs, and that percent is expected to jump to 66% in 2012. Junior Achievement, ($5,000) a hands-on enterprise recreating real world experiences and dilemmas has been successfully instituted at Center Street and Richmond Street elementary for the past three years, reaching approximately 600+ children in grades three through five. Students navigate the world of business, finance, city planning, and come to understand the cycle of interdependence of commerce and agriculture through planned and guided activities, giving them insights into how the inter-relatedness of commerce affects all global citizens. The Stock Market Curriculum ($3,000) at the elementary level dovetails with the knowledge and experience students gain in Junior Achievement and allows them hands-on experience to track how money flows through the financial markets. Last year students at Richmond Street School won 1st place for all of Los Angeles County and came in 13 out of 1885 teams nationwide in the Stock Market Competition. Financial Literacy is increasingly important given the choices students will be making about assuming debt to complete their higher educations. International Baccalaureate, The Middle Years Programme ($25,000) is a globally recognized curriculum intended to broaden students’ mindsets and horizons by cross-pollinating curriculum to better understand the inter-relatedness of all core subjects and to embed a global view of the world. Based on teaching students to challenge themselves to understand the “butterfly effect” across our increasingly flat planet, this rigorous program prepares students to be global thinkers and citizens. This program necessitates intense professional development for staff to rethink and recalibrate lesson plans and methodologies of teaching, and will impact all 800 students not just at ESMS, but also at the high school level when they matriculate. The CMAST Program (Center for Math & Science Teaching) ($25,000) under the tutelage of Loyola Marymount University is based upon teaching strategies and practices designed to capitalize upon a deeper, richer understanding of math concepts rather than rote recitation or memorization. This program has created an air of excitement among students participating at El Segundo Middle School unlike any math program. The goal is to create a generation of students who are not “math averse” and who gain confidence and enhanced interest in not just math, but the many various careers available to students with well-grounded math knowledge. ESUSD resides in one of the most technologically advanced locations in the world. By all accounts, scientific and employment needs will go essentially unmet in the United States for years to come. Partially funded by last year’s grant, the Robotics Program ($30,000) serves over 50 students in grades 6 – 12 at both the middle and high schools. This ongoing program allows students to think “outside the box,” as well as network with like-minded students. Students find themselves depending on one another for problem solving, collaboration, communication, and developing a tireless work ethic to support the rigors of the program. Students engage in a rigorous enterprise dedicated to building a functioning robot to enter into competitions, as well as showing up prepared to brainstorm “on the spot” to solve complex problems handed to the team by the judges with as little as one hour to solve the problem. One important aspect of the Robotics program is the level of support and mentorships by Northrop Grumman, Boeing, Los Angeles Air Force Base and other aerospace companies, with professional engineers and scientists laboring shoulder to shoulder with dedicated students late into the night to ready them for competitions. The Robotics Program has competed and placed strongly in several major competitions. At the elementary level, the STEPUP/Lego Program ($8,000) introduces students to concepts of engineering while enforcing California Science Content Standards with hands on learning. The STEPUP program is designed to teach over 200 5th grade students fundamental physics and engineering concepts using projects constructed with LEGO components. The instructor explains lesson concepts verbally while demonstrating them with fully or partially constructed projects, and corresponding mathematic formulae, computations and relations are introduced or reviewed. Students are encouraged to imagine and construct scenarios that reflect current, interdisciplinary subject matter, e.g., revolutionary/colonial America, and to refine their projects accordingly. The cleanup process helps students to logically differentiate and classify components in accordance with their structural and/or mechanical qualities and applications. Parent/community surveys conducted by the Education Foundation resulted in overwhelming parent support for STEM (Science, Technology, Engineering & Math) programs. Dovetailing that survey was a high school survey of a random sampling of 9th – 12th grade students, mirroring their parents’ enthusiasm by citing Health Science as their number two popular career pick. Based upon student interest from that survey, and with the support of the MURAD Corporation, the Biomedical Sciences Pathway (Project Lead the Way) ($102,000) will be implemented at the high school in August of 2012. This sequence of 4 classes over 4 years is specifically designed to create hands-on curriculum to give students real world experience for scores of different careers supporting medicine – one of the fields trended to undergo the largest explosion of career opportunities in the next several decades. Students will be exposed to guest speakers, integrated lesson plans requiring not just critical thinking but also collaboration and communication, while using creativity to solve medical problems embedded into the exciting curriculum. Creating new solutions to old problems will undoubtedly be the growth industry of the 21st Century. Allowing students to live entirely in their minds, fueled by self-expression and the inspiration of the music, art, drama, theatre of previous generations is one of the richest gifts an educator can bestow upon a student. And that creativity pays society back ten-fold: Steve Jobs knew computers, but he also understood the sublime of design as witnessed by millions of us cradling iPads, iPods and iPhones for the sheer luxury of the experience – before we’ve even booted up. Technology ($95,000) is not an option – it’s a requirement for our digital citizens. Technology puts learning into our students’ hands and creates a more vital, immediate, compelling learning opportunity for all students across all grade levels. Witness the updating of the STEM acronym to STEAM ($40,000): Science, Technology, Engineering, Art and Math – as more and more corporations understand the creativity of the arts is not unto itself but something that transfers across all domains and inspires deeper, richer thinking. The ESUSD K – 12 Music/Vocal Program ($145,000) is a direct reflection of creativity, self-expression, appreciation for beauty and honing of talent. Students at the elementary level eagerly look forward to the music hour incorporated into the weekly curriculum. All students at all levels enthusiastically support the performing arts aspects of the programs where they learn to collaborate and communicate while performing and presenting themselves to the public in a composed and professional manner. The standing room only performances speak to this fact, as well as the beautiful social and musical harmonies created among groups of school children all collaborating seamlessly in pursuit of creative expression. The music program is one that lends itself to the greatest amount of articulation and collaboration among the schools sites and grade levels, involving our tiniest members to our about-to-graduate most polished performers. At the elementary level music instruction provides students a chance to sing alone, in groups, play instruments, dance, express themselves through music, read music, as well as perform for an audience. The elementary choirs include 140 students who perform with the district-wide Songfest as well as entertain at community events. At the high school level students attained such levels of excellence that they performed in London for the 2012 Summer Olympics. The Eagles’ Nest Preschool Music Program is an opportunity for ESUSD’s three and four-year-old students to begin to tap into their muse via “Music ‘n Motion,” a program created to inspire an appreciation for both music and movement, allowing our littlest students the freedom to create, express, and appreciate. Musical Instruments ($10,000) to support the middle school creates ample opportunities for all budding musicians to participate in the arts. Young adults have an insatiable need to be heard – and indeed, this stands them in good stead in the 21st Century world of work. Communication is key: 85% of people with online access communicate via email, and 62% communicate through social network sites. Learning to express one’s message clearly and concisely is a hallmark of the working world. The ESHS Drama Program ($15,000) exposes students to a world of communication strategies including public speaking, text analysis, dramatic interpretation and analysis of subliminal messages buried in context. And their communication skills don’t stand alone – creativity, critical thinking and collaboration are all integrated into the fabric of the drama program, allowing students to develop their own voice, world view and a safe place for self-expression – while entertaining and enlightening hundreds of fellow students and thousands of community members. The Literacy Programs ($92,000) at both elementary schools provide the ballast for struggling student readers via coaches who work painstakingly with students to crack open the curriculum and help them enter the rich world of text. Poor readers at the primary grades pay a huge price, continuously sliding backwards as their peers stride forward. These coaches are the safety net to their futures, in turn creating confident, life-long learners with plenty to share about themselves and their world. The ESMS Counselor ($85,000) creates a safe sounding board for students faced with the most stressful rite of passage – adolescence. Beyond just serving as academic advisor to help students begin the process of preparation for young adulthood, the counselor also helps students navigate the emotional and social stresses of these all too mysterious middle years, while designing programs and resources to assist students both inside and outside the classroom. The ability to use one’s time effectively is a hallmark skill of 21st Century living. Prioritizing, planning, delegating and effective time management creates the gulf that divides those who succeed and those who fail. AVID (Advancement Via Individual Determination) ($65,000) is a school wide El Segundo High School program for grades 9 through 12 designed to maximize students’ academic potential through skill building for success. The support from the ESEF enables approximately 120 students with diverse backgrounds to focus on learning personal responsibility, taking ownership of their work ethic, and developing and implementing written and communication skills across the curriculum. AVID also exposes these underserved students to not just the possibility, but also the reality of a college education enriching their lives – often the very first generation to enjoy such luxury. Yearly excursions to college campuses create a visceral connection to a reality long elusive to them. This is the fifth year of AVID, creating an entire new cohort of college-educated citizens. “Link Crew” ($5,000) is a highly defined and structured transitional leadership program that engages the incoming 9th graders in exciting and purposeful activities, introducing students not just to their new campus, but also introducing them to and pairing them with well-trained upper classmate mentors. This in turn models behaviors and social and academic skills integral to learning how to self-regulate and self-manage in difficult times, and helps embed structured discipline for academic achievement. Research indicates that students who transition from the 8th to 9th grade in a structured and supportive environment enjoy a higher level of success, both emotionally and academically, than students receiving a lower level of support. Over 1,300 freshmen have successfully transitioned through this program. In other words, students need to be prepared by the time they leave high school to have developed competencies in the skills demanded by the workplace and college: critical thinking, self-management, problem solving, creativity, communication – in addition to academic achievement. In years past, our district-wide vision of embedding 21st Century Skills into the curriculum has been supported by the El Segundo Education Foundation. Additionally, the Foundation supported ESUSD’s assertion that employers demand not just fit minds but also fit bodies, as well as acknowledging the contribution the arts make to fostering creativity, discipline and a sense of well-being. In previous years the Foundation’s support of programs was extraordinarily valuable. In the 2011-12 budgetary climate, the Foundation’s support is simply incalculable. Without you, our students would be hearing the sound of doors slamming on opportunities for their very futures. Teaching a child to think is like teaching someone to fish – they will feed themselves for life. Not only is it important that children become critical thinkers to navigate an ever complex society, but critical thinking enriches a child’s world view, encourages a child to honor past experiences for lessons learned, and translates into the confidence to think like an entrepreneur in an increasingly entrepreneurial society. Junior Achievement, ($10,000) a hands-on enterprise recreating real world experiences and dilemmas has been successfully instituted at Center Street for the past two years. Based on its success in its first year, the program expanded from one grade level to grades 3 through 5. Students navigate the world of business, finance, city planning, and come to understand the cycle of interdependence of commerce and agriculture through planned and guided activities. Due to its success, Richmond Street jumped on board and in 2011-12 both elementary sites will institute the Junior Achievement Program affecting close to 600 students. International Baccalaureate, The Middle Years Programme ($25,000) is a globally recognized curriculum intended to broaden students’ mindsets and horizons by cross-pollinating curriculum to better understand the inter-relatedness of all core subjects and to embed a global view of the world. Based on teaching students to challenge themselves to understand the “butterfly effect” across our increasingly flat planet, this rigorous program prepares students to be global thinkers and citizens. This program necessitates intense professional development for staff to rethink and recalibrate lesson plans and methodologies of teaching, and will impact all 800 students not just at ESMS, but also at the high school level when they matriculate. The Science, Technology, Engineering & Math (STEM) Elementary Program ($15,000) gives support to exciting, hands-on projects for over 200 students using programs devised around the integration of technology (Mac carts, iTouches) in the classroom – projects such as stock market simulations and developing travel agent portfolios to expand student knowledge of world cultures and societies while exploring potential careers. ESUSD resides in one of the most technologically advanced locations in the world. By all accounts, scientific and employment needs will go essentially unmet in the United States for years to come. Partially funded by last year’s grant, the Robotics Program ($30,000) serves over 50 students in grades 6 – 12 at both the middle and high schools. This ongoing program allows students to think “outside the box,” as well as network with like-minded students. Students find themselves depending on one another for problem solving, collaboration, communication, and developing a tireless work ethic to support the rigors of the program. Students engage in a rigorous enterprise dedicated to building a functioning robot to enter into competitions, as well as showing up prepared to brainstorm “on the spot” to solve complex problems handed to the team by the judges with as little as one hour to solve the problem. One important aspect of the Robotics program is the level of support and mentorships by Northrop Grumman, Boeing, Los Angeles Air Force Base and other aerospace companies, with professional engineers and scientists laboring shoulder to shoulder with dedicated students late into the night to ready them for competitions. The Robotics Program has competed and placed strongly in several major competitions. At the elementary level, the STEPUP/Lego Program ($7,500) introduces students to concepts of engineering while enforcing California Science Content Standards with hands on learning. The STEPUP program is designed to teach over 200 5th grade students fundamental physics and engineering concepts using projects constructed with LEGO components. The instructor explains lesson concepts verbally while demonstrating them with fully or partially constructed projects, and corresponding mathematic formulae, computations and relations are introduced or reviewed. Students are encouraged to imagine and construct scenarios that reflect current, interdisciplinary subject matter, e.g., revolutionary/colonial America, and to refine their projects accordingly. The cleanup process helps students to logically differentiate and classify components in accordance with their structural and/or mechanical qualities and applications. Recent parent/community surveys conducted by the Education Foundation resulted in overwhelming parent support for STEM (Science, Technology, Engineering & Math) programs. Dovetailing that survey was a high school survey of all 9th – 12th grade students, mirroring their parents’ enthusiasm by citing Health Science as their number two popular career pick. But without the Grades 6 – 12 Science Program ($100,000) support from the Education Foundation to mitigate and offset looming cuts to science programs, ESUSD could not continue to offer strong STEM offerings allowing all students opportunities to develop innate curiosity about not just “what is” on the planet but arouse the deeper question of “what if?” by encouraging scientific inquiry. Nothing is more timely and of greater consequence than encouraging students to become stewards of the planet through understanding and conceptualizing the power of a better tomorrow. Creating and self-expression are as old as drawings etched into cavemen’s walls. Communication through the arts allows every voice to be heard through a personal methodology of self-expression, freeing the soul and stamping each psyche with validation for the internal life. The Visual & Performing Arts grades 6 – 12 Program ($100,000) gives hundreds of the “road less traveled” students a safe haven for communicating through the performing arts about themselves, their relationships with the world, and how they personally fit into it. Again, the parent/community survey conducted by the Education Foundation showed robust support for the arts. And again, the high school survey reflected this as well as evidenced by Arts, Audio/Visual Technology & Communications as the number one career choice among 9 – 12 grade students. Support from the Education Foundation for these programs encourages the creativity needed to grow the next generation of avant-garde thinkers, inventors, entertainers and global citizens. Art speaks all languages – as evidenced through the African Drumming/Yoga Program ($2,500) embedded into Arena Alterative High School, encouraging students to channel their passions and emotions with a positive method of expression. The Literacy Programs ($91,000) at both elementary schools provide the ballast for struggling student readers via coaches who work painstakingly with students to crack open the curriculum and help them enter the rich world of text. Poor readers at the primary grades pay a huge price, continuously sliding backwards as their peers stride forward. These coaches are the safety net to their futures, in turn creating confident, life-long learners with plenty to share about themselves and their world. Support for top-notch student productions by the Drama Program ($15,000) at the high school allows for freedom of expression, communication and interpretation through theatrical and musical productions affecting hundreds of student performers and thousands in the community audience. The ability to use one’s time effectively is a hallmark skill of 21st Century living. Prioritizing, planning, delegating and effective time management create the gulf that divides those who succeed and those who fail. AVID (Advancement Via Individual Determination) ($65,000) is a school wide El Segundo High School program for grades 9 through 12 designed to maximize students’ academic potential through skill building for success. The support the ESEF provides approximately 120 students focuses specifically on students from diverse backgrounds learning personal responsibility, taking ownership of their work ethic, and developing and implementing written and communication skills across the curriculum. AVID also exposes these underserved students to not just the possibility, but the reality of a college education enriching their lives – often the very first generation to enjoy such luxury. Yearly excursions to college campuses create a visceral connection to a reality long elusive to them. This is the fifth year of AVID, creating an entire new cohort of college educated citizens. “Link Crew” ($5,000) is a highly defined and structured transitional leadership program that engages the incoming 9th graders in exciting and purposeful activities, introducing students not just to their new campus, but also introducing them to and pairing them with well-trained upper classmate mentors. This in turn models behaviors and social and academic skills integral to learning how to self-regulate and self-manage in difficult times, and helps embed structured discipline for academic achievement. Research indicates that students who transition from the 8th to 9th grade in a structured and supportive environment enjoy a higher level of success, both emotionally and academically, than students receiving a lower level of support. Over 1,000 freshmen have successfully transitioned through this program. Every dollar spent supporting The El Segundo High School Athletics Program ($40,000) by providing athletic equipment is a dollar spent building character, self-discipline, a powerful work ethic, as well as respect for the individual’s place within a larger organization and the skills to abide by and thrive within those constraints. The ability to come together to create something for the greater good is one of the most powerful skills for success in the team oriented 21st Century workplace. The ESUSD K – 12 Music Program ($138,000) is a direct reflection of Plato’s rumination – sparking creativity, self-expression, appreciation for beauty and honing of talent. Students at the elementary level eagerly look forward to the music hour incorporated into the weekly curriculum. All students at all levels enthusiastically support the performing arts aspects of the programs where they learn to collaborate and communicate while performing and presenting themselves to the public in a composed and professional manner. The standing room only performances speak to this fact, as well as the beautiful social and musical harmonies created among groups of school children all collaborating seamlessly in pursuit of creative expression. The music program is one that lends itself to the greatest amount of articulation and collaboration among the schools sites and grade levels, involving our tiniest members to our about-to-graduate most polished performers. At the elementary level music instruction provides students a chance to sing alone, in groups, play instruments, dance, express themselves through music, read music, as well as perform for an audience. The elementary choirs include 140 students who perform with the district-wide Songfest as well as entertain at community events. At the high school level 116 students participate in the Chorale and Chamber choir proving continued support of the music program adds a highly collaborative, creative element to the curriculum, enriching the offerings for all students in the fine arts. The Eagles’ Nest Preschool Music Program ($12,000) is an opportunity for ESUSD’s three and four-year-old students to begin to tap into their muse via “Music ‘n Motion,” a program created to inspire an appreciation for both music and movement, allowing our littlest students the freedom to create, express, and appreciate. The El Segundo High School Band ($10,000) ranks as one of the most talented and supported programs in the district thanks to the contribution for instruments from the Education Foundation. Continuing and building upon ESUSD’s focus on 21st Century Skills, all program requests to the Education Foundation directly address the development and emphasis of the essential skills. As a district we believe it is imperative to emphasize these skills across the K – 12 curriculum to the end that all graduating seniors, whether advancing to college, the work force, or a professional academy (FIDM, Art Institute, Culinary Arts Institute etc.) excel in the 21st Century skills necessary to ensure success in a global economy. To support our district-wide vision, each of the following programs supports the outcome of students adopting and incorporating the above referenced 21st Century Skills. Let it also be said that the support of these programs by the Education Foundation during these extremely trying budget deficits is integral to allowing ESUSD to protect the rigor and excellence of the education offered El Segundo students. ESUSD resides in one of the most technologically advanced locations in the world. By all accounts, scientific and employment needs will go essentially unmet in the United States for years to come. Partially funded by last year’s grant, the Robotics Program serves over 50 students in grades 6 – 12 at both the middle and high schools. This ongoing program allows students to think “outside the box,” as well as network with like-minded students. Students find themselves depending on one another for problem solving, collaboration, communication, and developing a tireless work ethic to support the rigors of the program. Students engage in a rigorous enterprise dedicated to building a functioning robot to enter into competitions, as well as showing up prepared to brainstorm “on the spot” to solve complex problems handed to the team by the judges with sometimes as little as one hour to solve the problem. One important aspect of the Robotics program is the level of support and mentorships it has attracted by Northrop Grumman, Boeing, Los Angeles Air Force Base and other aerospace companies, with professional engineers and scientists laboring shoulder to shoulder with dedicated students late into the night to ready them for competitions. The Robotics Program has competed and placed strongly in several major competitions. Research indicates that students who transition from the 8th to 9th grade in a structured and supportive environment enjoy a higher level of success, both emotionally and academically, than students receiving a lower level of support. “Link Crew” is a highly defined and structured transitional leadership program that engages the incoming 9th graders in exciting and purposeful activities, introducing students not just to their new campus, but also introducing them to and pairing them with well-trained upper classmate mentors. These activities are also based on the ability of students to collaborate together while clearly communicating with one another to reach deeper levels of understanding designed to defuse conflict. These students serve not only as leaders for the incoming freshman class, but for their peers campus-wide on an ongoing basis. With the advent of the Link Crew program, students feel more connected not just to fellow students, but also to the sponsoring faculty members with whom they enjoy a warm and trusting rapport achieved through their ability to clearly communicate their thoughts, feelings and challenges. To date approximately 800 Freshmen have participated in the program, with an additional 180 Juniors and Seniors serving as mentors to the incoming students. UCLA Professor James Catterall specializes in the connection between the arts and social and academic development. He posits from his research that singing and playing musical instruments over the course of several years leads to better spatial reasoning skills whose benefits spill over into mathematics and language. Not only that, but music activates neuro-pathways also tied to emotion and empathy. All good things. The ESUSD K – 12 Music Program mirrors this equation. Students at the elementary level eagerly look forward to the music hour incorporated into the weekly curriculum. All students at all levels enthusiastically support the performing arts aspects of the programs where they learn to collaborate and communicate while performing and presenting themselves to the public in a composed and professional manner. The standing room only performances at the High School Auditorium speak to this fact, as well as the beautiful social and musical harmonies created among groups of school children all working seamlessly together in pursuit of the arts. The music program is one that lends itself to the greatest amount of articulation and collaboration among the schools sites and grade levels, involving our tiniest members to our about-to-graduate most polished performers. At the elementary level music instruction provides students a chance to sing alone, in groups, play instruments, dance, express themselves through music, read music, as well as perform for an audience. The elementary choirs include 147 students who perform with the district-wide Songfest as well as entertain at community events. At the high school level 56 students participate in the Chorale and Chamber choir proving that continued support of the music program adds a highly collaborative, creative element to the curriculum, enriching the offerings for all students in the fine arts – and is greatly appreciated. Small wonder Beethoven mused, “Music is a higher revelation than all wisdom and philosophy. The success in prior years of “writing across the curriculum” under the tutelage of the UCLA Writing program has clearly been reflected in the 4th and 7th grade writing scores (a component of the STAR CST scores). Surveys and studies underscore the importance of writing in the workplace by indicating the major communication tool of the 21st Century is via email, an instrument designed to achieve communication across global time changes, vast distances, as well as down the hall to the corner office. The ability to compose one’s thoughts by clear, concise writing is an ongoing skill pursued across the K – 12 curriculum. However – an equally vital component to the 21st Century Literacy Skills is the ability to understand the written word within a greater (and oftentimes ambiguous) context. ESUSD understands the importance of offering equal support to promote literacy at all grade levels. Funding of a literacy program through the Education Foundation allows struggling readers individual and small group coaching so imperative to success not just in English Language Arts, but also access to curriculum ultimately preparing them for the demands of the workplace. The Literacy Program will serve approximately 115 Kinder through Grade 3 students as well as an additional 60 4th & 5th grade students with intensive instruction in one-on-one and small group coaching and support. The program will also impact classroom learning by freeing teachers from struggling to deliver instructional content to a hugely disparate group of learners. The program will enrich the curriculum by planning and implementing professional development both on site and district-wide via sharing best practices in literacy, writing, composition and curriculum with over 170 teachers and instructional assistants. One of the vital elements to personal wellness above and beyond the physical is the social/emotional component so necessary to achieving well-rounded, productive citizens. Counselors available for our students are a vital force in hearing student concerns, advising them on social/emotional issues, and steering them down a positive academic path. The counseling program will create vital programs addressing the emotional and academic pitfalls indigenous to this age group. The program objectives will stay connected to the emotional and social pulse of these middle school students making the treacherous transition from elementary school to the rigors and demands of high school. This program is an all-important bridge to safety through these formative and emotionally demanding years. Additionally the middle school counseling program will support programs students during the middle school advisory period, including Character Counts, Internet safety issues, tobacco prevention, and anti-bullying strategies. The focus of 2009-2010 professional development was on “How the Brain Learns” in order to understand cutting edge science and how that affects teaching and learning as pertains to embedding 21st Century Skills into the core curriculum. The focus of 2020-11 professional development is “The Thin STEM Line” – articulation of science and math across school sites to identify and fill in gaps in curriculum between 5th and 6th grades and 8th and 9th grades. The Boeing Grant will also support teacher training in the use of technology to integrate iPod touches into the math/science curriculum at the elementary and middle schools and professional development at the high school for the engineering lab. At the middle school level the International Baccalaureate research has begun to determine the feasibility of incorporating IB school-wide. Extensive professional development will be necessary for staff to implement these large scale changes to the curriculum and the Boeing Grant will support those efforts especially in the areas of science and math. Continuing and building upon ESUSD’s focus on 21st Century Skills, all program requests to the Educational Foundation directly address the development and emphasis of the essential skills. As a district we believe it is imperative to emphasize these skills across the K – 12 curriculum to the end that all graduating seniors, whether advancing to college, the work force, or a professional academy (FIDM, Art Institute, Culinary Arts Institute etc.) excel in the 21st Century skills necessary to ensure success in a global economy. 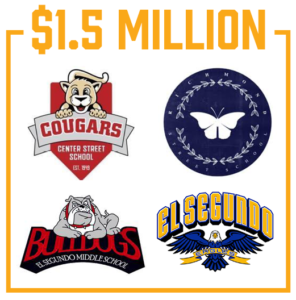 Let it also be said that the support of these programs by the Educational Foundation during these extremely trying budget deficits is integral to allowing ESUSD to protect the rigor and excellence of the education offered El Segundo students. ESUSD resides in one of the most technologically advanced locations in the world. By all accounts, scientific and employment needs will go essentially unmet in the United States for years to come. Partially funded by last year’s grant, the Robotics Program serves over 50 students in grades 6 – 12 at both the middle and high schools. This ongoing program allows students to think “outside the box,” as well as network with like-minded students. Students find themselves depending on one another for problem solving, collaboration, communication, and developing a tireless work ethic to support the rigors of the program. Students engage in a rigorous enterprise dedicated to building a functioning robot to enter into competitions, as well as showing up prepared to brainstorm “on the spot” to solve complex problems handed to the team by the judges with sometimes as little as one hour to solve the problem. One important aspect of the Robotics program is the level of support and mentorships it has attracted by Northrop Grumman, Boeing, Los Angeles Air Force Base and other aerospace companies, with professional engineers and scientists laboring shoulder to shoulder with dedicated students late into the night to ready them for competitions. The Robotics Program has competed and placed strongly in several major competitions – as well as having been invited to participate in a major tournament in Hawaii in the spring of 2010. One of the (many) reasons for the financial calamity blanketing our nation is that we graduate classes of students who are financially illiterate. This not only condemns them to a life of struggle and misery, but it makes them easy prey for those out there with no compunction about getting someone into debt way beyond their ability to dig their way out. ESHS is beginning its second year of a “Financial Literacy” course at the high school using 1-to-1 laptops. It has been a smashing success, especially since this level of math class usually attracted struggling math students who needed a third year of math to graduate who signed up under great duress. These students study the entrepreneurial and personal aspects of finance, with students responsible for creating an entrepreneurial endeavor encompassing all aspects of business. The level of self-respect, work ethic and output of effort the students have displayed this year has not gone unnoticed. Even more advanced students are trying to clear a spot on their schedules to enroll. This is a classic case of using 21st Century tools in the classroom to deliver 21st Century content to close to 100 students. Contextual learning teaches students to monitor and direct their own learning to become self-regulated learners, teaches students an appreciation for diverse life-contexts, and encourages students to learn from each other and together. AVID (Advancement Via Individual Determination) is a school wide El Segundo High School program for grades 9 through 12 designed to maximize students’ academic potential through the very 21st Century skill of contextual learning. The support the ESEF provides focuses specifically on students from diverse backgrounds learning how to take pride in personal responsibility, to take ownership of their work ethic, and to develop and implement written and communication skills across the curriculum. AVID also exposes these underserved students to not just the possibility, but the reality of a college education enriching their lives – often the very first generation to enjoy such luxury. This year 45 AVID students toured college campuses from Cal State Northridge, to UCSB, to Cal Poly San Luis Obispo. To date the program has enrolled 88 students, with an additional 37 students recruited to begin the 2009-2010 year as Freshmen. The phenomenal success of the AVID program is such that El Segundo Middle School has noticed the success of their 8th graders moving on to the high school – and is equally passionate about starting an AVID cohort at its site. They would partner over the 2009-2010 school years with the high school, learning the program as well as sending a potential AVID coordinator to trainings in the summer to begin the planning process of rolling out AVID at the Middle School in 2010-2011, thereby opening students’ eyes to the impact of education and college at an even younger age. To date approximately 510 Freshmen have participated in the program, with an additional 130 Juniors and Seniors serving as mentors to the incoming students. Georgia Technological Institute struggled to keep students enrolled for the entire four years in the Engineering Department until one of the professors stumbled across a secret: he kept spotting engineering students at local symphonies and concerts, and decided to introduce music courses to the undergraduate curriculum. He soon learned engineers do not survive by logarithms alone – while he watched the graduation rate soar. The success in prior years of “writing across the curriculum” under the tutelage of the UCLA Writing program has clearly been reflected in the 4th and 7th grade writing scores (a component of the STAR CST scores). Surveys and studies underscore the importance of writing in the workplace by indicating the major communication tool of the 21st Century is via email, an instrument designed to achieve communication across global time changes, vast distances, as well as down the hall to the corner office. The ability to compose one’s thoughts by clear, concise writing is an ongoing skill pursued across the K – 12 curriculum. However – an equally vital component to the 21st Century Literacy Skills is the ability to understand the written word within a greater (and oftentimes ambiguous) context. ESUSD understands the importance of offering equal support to promote literacy at all grade levels via trained Literacy Coaches. Funding of a literacy coach through the Educational Foundation would allow struggling readers to get the individual and small group coaching so imperative to ensuring success in struggling readers, ensuring their success not just in English Language Arts, but also access to curriculum ultimately preparing them for the demands of the workplace. The Literacy Coaches serve approximately 115 Kinder through Grade 3 students as well as an additional 60 4th & 5th grade students with intensive instruction in one-on-one and small group coaching and support. The coaches also impact classroom learning by freeing teachers from struggling to deliver instructional content to a hugely disparate group of learners. Literacy Coaches also enrich the curriculum by planning and implementing professional development both on site and district-wide via sharing best practices in literacy, writing, composition and curriculum with over 170 teachers and instructional assistants. Technological support has grown increasingly crucial in the classroom in relation to the uptick in daily use of technological instruction across sites and curriculum, thanks to the infusion of the cutting edge technological tools provided to ESUSD by the El Segundo Educational Foundation. Technology has become one – if not the – instructional delivery choice in most El Segundo Unified classrooms. With this increased technological integration comes the added responsibility of not allowing that technology to fail at crucial junctures sending lesson plans and precious classroom instructional minutes awry. The ability to trouble-shoot and problem solve, as well as keep PowerSchool running smoothly for close to 3000 users is vital. The link between parents, students, and educators is woven into a fabric of support for students by their parents’ ability to instantly access attendance student grades, homework, teacher websites, and more. Due to the integration of technology directly into not just the classrooms but also students’ homes to benefit our digital natives, an additional $10,000 is requested to fund this ongoing support and training. With the implementation of InfoSnap (Online Annual Student Registration) complete at the elementary and middle schools, 2009-2010 will see the high school coming onboard so that all 3000+ students may benefit from electronic enrollment. Annually, parents need only update portions of information that have changed from prior years. Student data is subsequently imported into PowerSchool, resulting in a significant reduction in employee hours spent on data entry, as well as reducing paper and Xerox costs. All four sites will be up and online for a cost of $16,000. The nation-wide movement towards health and wellness addresses the skyrocketing rates of obesity in youth. Educating children about the importance of a healthy mind-body connection not only staves off debilitating disease later in life, but research proves it helps students resist “at risk” behaviors such as smoking, drinking, and recreational drug-taking. ESUSD has made a commitment to promoting healthy foods and snacks on all campuses, and understands that educating children about not just what goes into their bodies, but also about maintaining those bodies as the machines they are is integral to a fit and healthy future. ESEF’s funding of physical education programs at the elementary levels would support roughly 400 students while they learn that physical activity diminishes depression, relieves stress, and raises endorphin levels which contribute to the feeling of “well being” experienced after an interval of physical exercise. Physical fitness not only teaches about healthy bodies – it also teaches healthy competition, good sportsmanship, and provides a positive outlet for frustration and excessive energy. Incorporating a physical fitness curriculum not only models for students the importance of day-to-day physical activity, but also allows students to focus and cuts down on classroom disruptions. “Bridges to Partnerships” is a result of surveys conducted by the Partnership for 21st Century Skills as interpreted by the ESUSD faculty throughout 2008-09 and continuing into 2009-2010. The Partnership for 21st Century Skills highlighted the areas of weaknesses that employers evaluated in new hires and the desired workforce skills needed to remain competitive in a global economy. In a 2007-2008 survey, ESUSD administration and faculty members indicated a need to partner directly with professionals in the community to bring their real-world expertise into the classroom and the curriculum. Shared areas of concern include motivating and engaging students in math and science. The focus of 2009-2010 will be to continue the extension of the curriculum beyond the classroom using projects and curriculum developed during the professional development year, while continuing to research and imbed 21st Century Skills into the core curriculum. Copyright © 2017 ESEdF.org. All rights reserved. ESEdF is a Non-Profit 501(c)(3) FED ID 95-3885992.